The first three of WestJet's 10 new long-distance Boeing 787-9 Dreaminers will offer direct international flights between Calgary and Europe, the company announces. The first three of WestJet's 10 new long-distance Boeing 787-9 Dreamliners will offer direct international flights between Calgary and Europe, the company announced Wednesday. The new planes mean direct flights between Calgary, Dublin and Paris. One of the new planes will also fly the already established Calgary to London, England, route. "This is a huge day for WestJet. This signals our first real venture into becoming a full-service, fully global network carrier," said airline chief executive Ed Sims. "It's a transformation of an organization that started 22 years ago, flying low cost, point-to-point. We're now rubbing shoulders with the big guys around the world." 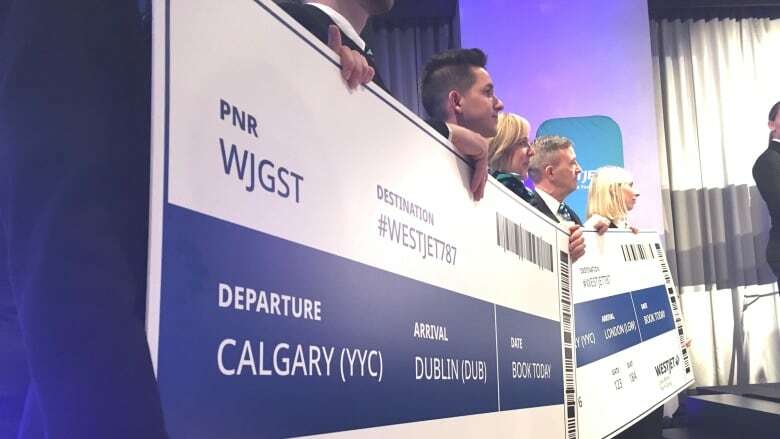 WestJet also hopes the routes will bring up to 185,000 visitors to the Calgary area each year, starting in April 2019 when the international flights are scheduled to start. Sims said the new routes and schedules will ease trans-Atlantic travel troubles for local people. "One of the advantages of having a Calgary-based carrier flying out of Calgary is we get to chose our slots that are best for Albertans," he said. "So we'll be flying these international routes between 7 o'clock in the morning and 10 o'clock in the morning." The company said the three new routes will support 650 full-time jobs and $100 million in economic output. The Dreamliners have a range of 14,000 kilometres and are said to be as much as 20 per cent more fuel efficient than WestJet's current fleet of 767s. WestJet has ordered a total of 10 of the planes, with the first arriving in Calgary in early 2019 and the other two by April, according to the airline. The hubs for those additional planes has not been announced. The company also has options for an additional 10 Dreamliners to arrive between 2020 and 2024. Each plane will carry 320 guests in business, premium and economy-class sections. The newly revealed business class features 16 private pods with lie-flat seats.